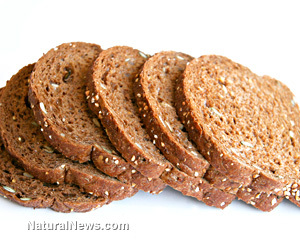 (NaturalNews) Whether you already suffer from known intolerances and toxic reactions to gluten or you're proactively looking to improve your overall health, avoiding the infamous grain protein altogether may seem a bit daunting at first -- but only at first. As greater numbers of consumers begin to educate themselves and take responsibility for their own health, rather than trusting in the failing patterns of conventional Western medicine, alternatives not only abound, but are becoming increasingly creative in approach. Yes, gluten seems to be everywhere. It saturates supermarkets, bakeries and restaurants. An elastic protein found in grains like wheat, rye, barley, semolina, spelt, kamut and even oats (thanks to cross contamination that occurs during processing), gluten literally helps to give rise to all manner of bread-like foods. From buns and bagels to cakes and cookies, gluten also assists in achieving the desired texture, kneadability and structure of these foods. That means replacing it with something healthier requires a little education and finesse. Education comes first. Surprising though it may be to those who know better, there are some who still argue that the gluten-free diet is just another passing "fad diet." Such a perspective certainly disregards the facts. Even conventional medicine currently acknowledges a small number of disorders likely to stem from the consumption of wheat, including wheat allergy, celiac disease, dermatitis herpetiformis and exercise-induced wheat anaphylaxis. But the truth of the matter is much more bleak. GreenMedInfo has posted a list of more than 200 conditions associated with wheat consumption (http://www.greenmedinfo.com). The list was compiled according to research appearing only in peer-reviewed and published medical journals as indexed by MEDLINE, the National Library of Medicine's biomedical database. In fact, in keeping with the recent exponential increase in interest on the subject of gluten toxicity, the total number of MEDLINE listed studies referencing gluten has also skyrocketed, from 71 studies completed in 1971, to a whopping 514 performed in 2011. At one time considered a very rare condition, a growing number of studies indicate that celiac disease alone now affects up to one in every 133 people in the United States - a great deal higher ratio than was initially estimated - with general gluten toxicity likely affecting many more, some of whom may not even be aware of what really ails them. According to Dr. Larry Wilson, M.D., the real cause of celiac disease and other intolerances associated with gluten may actually be a damaged intestinal system. Most people do not secrete enough digestive enzymes to properly digest their food, he says, and most do not drink enough of the correct type of water. At the same time, they're eating foods such as those containing gluten, which subtly irritate their intestinal tract, perhaps even setting off an intestinal infection, making matters worse. He recommends a nutritional balancing program to address this underlying problem. For those ready to take the leap away from a gluten-saturated diet, some relief may be found by simply replacing certain items with care; in other cases, a little finesse may be required. Safe, gluten-free substitutions for flours and starches include seed flours (flax, buckwheat, millet, amaranth, quinoa), tuber flours (arrowroot, sweet potato, etc.) and nut flours (almond, walnut, etc. ); however, when baking remember it may be necessary to include extra egg whites or other ingredients to improve viscosity, as you are not likely to get the same results from a simple one-to-one flour substitution as you do when using wheat flour. To replace unsafe pasta, bread or noodles, consider brown rice or organic (non-GMO) corn meal. If purchasing at the market, look for those without commercial flavorings. For a more thorough list of substitution ideas, as well as hints on what foods to avoid, please visit Gluten Free Works (http://glutenfreeworks.com/diet-and-health/food-substitutes/) and the Gluten Free Goddess (http://glutenfreegoddess.blogspot.com). And don't forget to check package labels for hidden GMO ingredients.